Every office needs a break room where employees can congregate to enjoy some time away from their work. This ensures that food and socializing stay far from where they could be distractions or where the former could cause a mess. However, if you don’t have a particularly inviting break room, you really can’t expect your employees to look forward to spending a lot of time there. So consider how these 10 appliances could help improve this essential room and how much your employees enjoy it. Despite the enthusiasm from employers for more collaborative space, not everyone is convinced that workers prefer such an environment, especially if it comes at the expense of private space. Whatever the benefits or appeal of collaborative space, businesses also have embraced open office design in part because the condensed layout lowers real estate costs. No office is complete without at least one coffee maker. Whether it’s first thing in the morning to pop one’s eyes open or later in the day to keep them from falling into an afternoon slump, everyone loves a nice, hot, fresh cup of coffee. These days, there are too many types of coffee makers to count. You can choose from machines that will brew a single, specialty cup or the traditional kind that makes whole pots when set to brew. It’s also not uncommon to see an office offer their employees an espresso machine to give them a quick shot of caffeine, or make the fancier coffee drinks, like Americanos, macchiatos, and cappuccinos. Of course, not all of your employees will crave coffee, even when it means some of the more exotic versions listed above. Their drink of choice, instead, may be a simple cup of tea. Because of this, it’s not uncommon businesses to supply a variety of teabags for their employees. With a cup of tea comes the need for hot water. Sure, you’re employees could microwave their water to make it hot enough to brew tea, but most tea drinkers will prefer to have a tea kettle on hand so they can brew themselves a cup at their convenience. The water cooler is probably the most recognizable appliance found in an office breakroom. No matter whether your employees drink coffee or tea (or neither), every employee needs water throughout the day and a water cooler is easily the best way to provide it. These appliances not only hold gallons of water, but they constantly offer up cold, and sometimes hot, water at all times. Added filtration also means the water is crystal clear and tastes great. Of course, this appliance is the perfect source for water when you want to make coffee or tea too. Just be wary of all the office gossip that may take place around the water cooler. If an employee feels like some other beverage, perhaps a soda or an energy drink, they’ll probably prefer it chilled. So long as you have an ice maker on hand, this is never a problem. While you could use ice trays for this, that means relying on employees to make ice every time you run out. It’s so much easier to simply automate the process by having a machine handle it. Whether it’s built into the cabinets of your break room or a portable version sitting on top of the counter tops, an ice maker will make ice cubes around the clock and keep dozens of them stored until your employees need them. Ice trays, on the other hand, simply can’t do this. Another absolute essential in the office is a microwave. Whether your employees will use it to make their lunch or reheat it, no office break room is worth much without at least one microwave on hand. Not only will they be used by nearly everyone in your office, but they’re easy to maintain and one of the most affordable appliances you can own. Toasters are another essential appliance for your office break room. As with microwaves, a lot of employees will use them to help make their lunch. But many may also rely on a toaster for heating up their breakfast in the morning as well. Not only are they compact and portable, they’re also easy to clean and cheap enough to buy on a whim. Those employees who pack their own lunch will love having a fridge available to them in the office. Whether it’s a mini fridge or a larger, full-sized fridge, your employees will appreciate being able to drop off their lunch in the morning and know it will be waiting for them at lunchtime, fresh and tasty as if they just made it. Knowing which size fridge is best for your office all depends on how many people that work there. If you have hundreds of employees, obviously you’ll need a larger fridge, if not multiple fridges in your break room. If you only have a few employees, you may be able to get away with a more compact refrigerator. 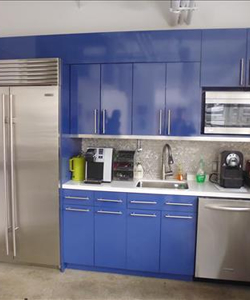 Depending on the business you’re in, the size of your office, etc., it may make sense to have a beverage refrigerator around. These are refrigerators specifically designed for storing the various beverages you may keep on hand. Most feature shelving options you can easily adjust to hold 12 oz cans. However, there are models that can just as easily hold milk cartons, wine bottles, beer bottles and more. This is a great appliance to have on hand for your employees, but there’s no doubt visiting clients will love it too. You’ll always have their favorite beverage on hand, nice and cold and with plenty in stock. Their clear door not only gains it presentation points, but makes it easy to notice when you’re running low on certain beverages. Popcorn makes a fantastic snack during work. It’s quick and easy to make, filling and plenty tasty. However, as anyone who has worked in an office can tell you, making popcorn apparently isn’t always as easy as it seems. One burnt bag in the microwave and the whole office reeks of it for the rest of the day. Instead, why not have a popcorn maker on hand? This appliance will take care of any guesswork and ensure both your employees and your customers always have their favorite snack close by. If you’re really in the mood to treat your employees and create a culture to attract talent, then it doesn’t get much better than a kegerator. These mini-fridges keep your keg of beer (or wine) at your desired temperature, giving your employees ice cold draft beer on demand. 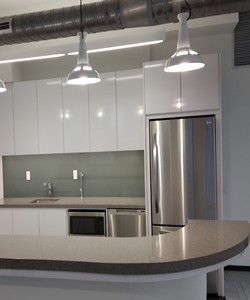 You can have a kegerator built directly into the countertops of your breakroom or have a freestanding version sitting in the bosses’ office. So, whether you take casual Fridays seriously or you just want beer on hand for celebrations, having a draft beer dispenser in your office is the way to go. In order to truly be a break room, employees need to feel like they can actually take a break from work. This means having the above appliances available to help them make the most of time spent away from their desk. Just give us a call and we can discuss all the options at no obligation to you!